Harness the power of Liquid-Plumr to clean and deodorize your garbage disposal. 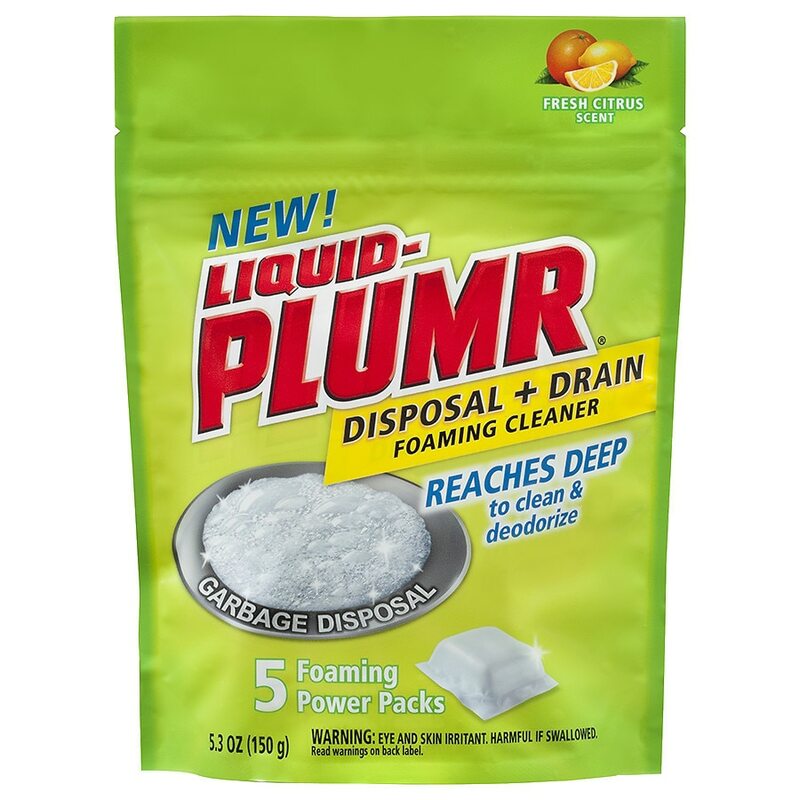 Liquid-Plumr Disposal Plus Drain Foaming Cleaner is specially formulated to deep clean inaccessible areas and eliminate lingering smells. It leaves nothing behind but a fresh citrus scent. Simply drop one foaming pack into your garbage disposal and in a few minutes you'll have a clean, odor-free disposal. Use regularly for the best drain cleaning and deodorizing results. Keep your drains clear with Liquid-Plumr. Start with empty sink and disposal turned off. Run a full stream of hot water for 1 minute. Reduce water flow to thin stream into side of sink. Insert one Foaming Power Pack completely into disposal. (Do not open pack.) Start cleaning by turning on disposal. Foam may rise into sink, or into both sinks if a double sink. Lasts 1 to 2 minutes. Turn off disposal when foam completely retreats into disposal. Rinse remaining foam from sides of sink. Seal the bag after each use. Eye and skin irritant. Harmful if swallowed. Do not get in eyes or on skin. Do not ingest. Do not use with other drain cleaners, including Liquid-Plumr products, as the release of hazardous gases may occur. First Aid: Eyes – rinse with water for 15 minutes. If irritation persists, call a doctor. If swallowed– Rinse mouth, drink a glass of water. Call a doctor or poison control center. Skin – Rinse with water. If irritation persists, call a doctor. Keep out of reach of children.